This category includes spending for district-level management, such as the expenses associated with boards of education, superintendents and other executive administrators, and community, state and federal relations services. Spending on legal services, union negotiations, elections, tax assessments, public relations and seeking and applying for state and federal grants are accounted for here. 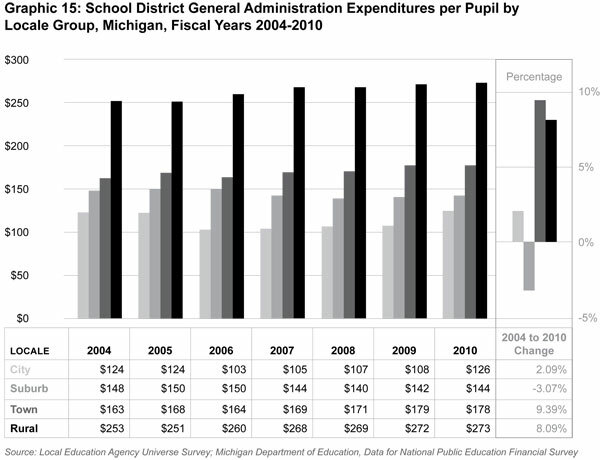 Per-pupil expenditures for general administration reverses the pattern seen with student support services and instructional staff support services. 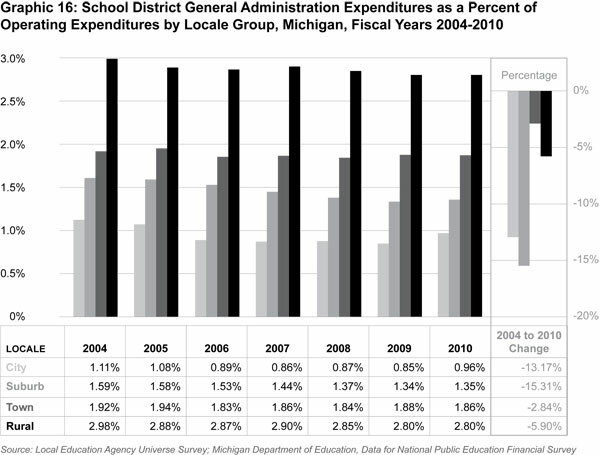 The rural locale group spent the most per pupil on general administration — about twice that of the city locale group (see Graphic 15). 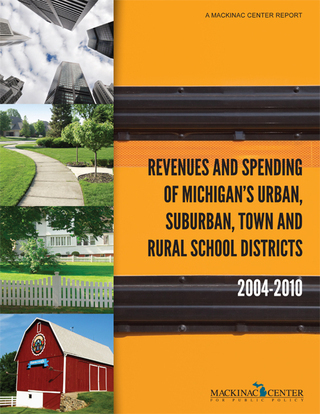 Additionally, per-pupil general administration spending grew for the town (9 percent) and rural groups (8 percent) from 2004 to 2010, while it fell for the suburban group (3 percent) and increased only slightly for the city group (2 percent). In fact, city districts on average spent the least in this area — $126 per pupil in 2010. [*] See Appendix B, Graphic 41. [†] See Appendix B, Graphic 42. “The National Public Education Financial Survey Instruction Booklet,” (National Center for Education Statistics, 2007), 54, http://www.ped.state .nm.us/div/fin/school.budget/dl08/recFinalReports0607/NPEFSManual.pdf (accessed March 22, 2011).